Bees must fly 94,000km to collect enough nectar to produce 2.75kg of honey to produce 500g of wax. Honey is the only food that includes all the substances necessary to sustain life including enzymes, vitamins, minerals and water. Our honey is from the Enniskillen valley and is collected from wild flowers including golden rod. Honey has been anecdotally reportedly to lessen symptoms in people with seasonal allergies. 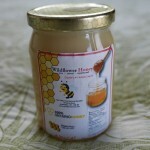 Honey contains traces of flower pollen – an allergen. And one treatment for allergies is repeated exposure to small amounts of allergens.